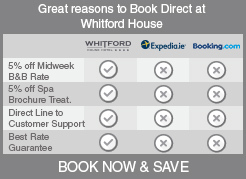 Book Direct Online Special and get 5% Offrom €93 per night B&B.Online Special exclusively for loyal Whitford Hotel Customers. Book now and receive 5% Off of our B&B rate. Advance Purchase 10% OffBook in advance and receive 10% off Please note full payment is taken from the card at the stage of the booking and is non refundable , none transferable. 2 Nights B&B 1 Dinnerfrom €112.00 pps Treat yourself to a haven of tranquility in which to unwind. Your evening dinner is in our award-winning Seasons Restaurant at the Weekend and Forthside Bar Midweek.